I was born and raised in the Park Slope section of Brooklyn, New York. In my career before moving to Florida I worked with metal shaping, welding, and designing for a major corporation in New York. Attending a school for blacksmiths at Peters Valley Craft Education Center in northwestern New Jersey brought out additional forms and expressions in my work. 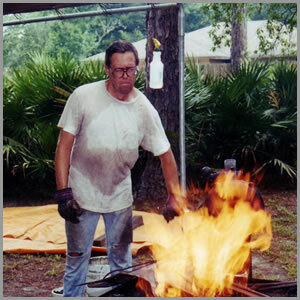 I now reside in St. Augustine, Florida where I	am a practicing sculptor-blacksmith. With 32 years of experience working with steel, I have found the best creative way of forming steel is to heat it on a coal-fired forge and then hammer the steel by hand. All my sculptures are one of a kind and are not cast. An idea will come to my mind, I will think about the size and weight of it, the expression on the face or the free flowing plant leaf of a fern. Forming these sculptures with a different weight of each hammer blow can bring about the texture, softness and life-like appearance of each finished piece. As the steel is turning a bright orange to yellow color in the forge, distortion of the metal will occur. Sometimes I will use this distortion and with the blows of the hammer I will create some fantastic effects on the piece. The dark patina is brought about by working the steel continuously in and out of the forge and applying a special formula of waxes and linseed oil to the metal. The polished steel patina is formed by hand sanding and applied with the same waxes and oils. I am presently working on large outdoor sculptures. My work has been on exhibit at Amsterdam Whitney International Fine Art Gallery located in Chelsea, New York City. In Florida my work has been on exhibit at 130 King Fine Art and World Treasures, the St. Augustine Art Association, the Page Edwards Gallery, P.A.St.A Fine Art Gallery, Augustine/St. Johns County Airport Gallery, Catch 22 Gallery, Donner Le Ton, and Eclipse Art Gallery in St. Augustine. In Jacksonville, I have been shown in Gallery L in the Modis Building, the Wilson Center, and the Gallery at the House of Stereo. Pieces of my art have been donated for silent auction to Habitat for Humanity and to H.A.W.K.E., which is a wildlife rescue center in St. Johns County, Florida. I was awarded prizes for work entered in the Fantastic Florida Show, the Cutting Edge Show, and the Honors Show at the St. Augustine Art Association and also for work at the Jacksonville Coalition for the Visual Arts (JCVA). I entered the Chelsea Global Showcase Art Competition and as a winner, my winning piece was displayed for the month of August during the annual Chelsea Global Showcase at the Amsterdam Whitney Gallery. The gala is televised on the Primetime Manhatten cable show.